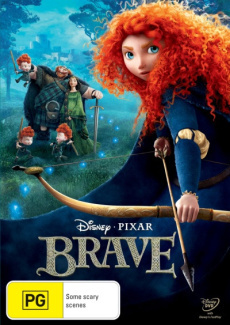 Brave took home the award for Best Animated Film at last week’s Golden Globes and is one of the nominees for Best Animated Film in this year’s Academy Awards. Pixar Animation Studios, the creator of Toy Story 3, whisks you away on an astonishing adventure in the Scottish Highlands full of mystery, magic and tradition. Determined to make her own path in life, Princess Merida, a skilled archer and headstrong daughter of King Fergus and Queen Elinor defies an age-old custom, where she competes against (and defeats) each of her suitors in an archery contest during the Highland Games by which she states she is “shooting for her own hand”, much to the outrage of the lords of the land and causes a rift between mother and daughter. Merida then acquires a magic spell from a witch the witch agrees to give Merida a spell to “change” her mother (into a bear) in the form of a cake. When chaos is unleashed in the kingdom as a result of Merida’s actions, she must harness all of her skills and resources to break the beastly curse before it’s too late, mend bonds “torn by pride” and discover the meaning of true bravery. From the kilt-wearing lords to the bagpipe music and traditional Highland games and Merida’s triplet brothers’ pranks and endless attempts to steel sweets, This is a very entertaining mother/daughter movie and a celebration of Scottish culture. Best for age groups 5 years and over. Next Article Back to School!